This past summer, my mom organized a mystery quilt for my quilt group. This is the third time she does this but it is the first time I have decided to participate. In the past, I have thought that summer is just such a busy time for me, but this year, my girls are older and I thought, why not?! I had so much fun working on this quilt! I used some low volume fabrics from my stash but I had to go buy some fat quarters from my LQS as well because I didn't have enough variety to go with the mediums and darks I had chosen. The mediums and darks are mostly Bonnie and Camille fabrics. I finished the quilt top in July and quilted it in September. I picked a floral quilting design since the fabrics had so many flowers on them. This quilt is so light in colour, I think it will be more of a spring and summer quilt so the flowers are very appropriate. I just finished the binding this past weekend, so from start to finish it took about 6 months. The pattern is Surrounded from the book Oh Scrap! by Lissa Alexander. I bought this book in the spring and my mom borrowed it. She loved the quilt so much she made it our mystery quilt! Five out of the nine of us have finished our quilts and we all love them! It was so much fun to work on this project together. We would send each other e-mails and pictures of our finished blocks to encourage each other. We sent each other photos of our finished quilts as well, and then brought them to our retreat a couple of weeks ago to show each other. Some of the girls who aren't done brought their blocks to work on their quilts. I love my quilty friends! 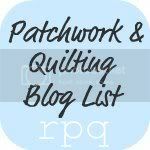 It's time for Blogger's Quilt Festival over at Amy's Creative Side! I love this Festival or online Quilt Show so much. It is just great fun to go see everyone's quilts. 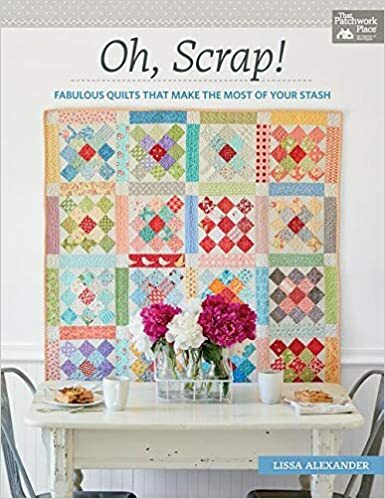 I find it very inspiring, and because they are blog posts, there is usually more info about the making of the quilt or the inspiration behind it than just the simple posts on Instagram or Facebook. You should click on the link above and go check out some of the quilts! So my entry for the Blogger's Quilt Festival is my Dresden Plate. This was a long time UFO that had been sitting in my closet. Last year my quilt group and I set a challenge for ourselves to finish some UFO's and this was the one I really had to get done. All I had done back in June 2017 when we set the challenge were the 12 blocks without the circles appliqued onto the dresdens. I wanted to make the blocks look a little more modern so I chose the black fabric with gold specs on it and decided to make huge circles. I really love the look of them. The dresdens had all been hand appliqued but in order to save some time, I decided to machine applique the circles using steam a seam lite2. I added sashing using the same fabric as the background, to give myself some interesting options for the quilting. I finished the top of the quilt in the fall and then took some time to decide how to quilt it. In April, I finally put it on the longarm and picked some patterns on the computer and started dividing my spaces. It took a few days and I used a mix of computerized designs, freemotion and ruler work. I used a layer of Hobbs Heirloom 80/20 batting and a layer of Hobbs Polydown so I could get the lovely texture from the quilting to show. I love the final result. Here are more close-ups of the quilting for you to enjoy. This was a great challenge and I am happy this quilt went from the UFO pile to the finished pile. Don't forget to go check out the Festival. It truly is like an online quilt show, and who doesn't love a quilt show?! I showed it to the teachers and we knew right away we wanted to make a version of it, and that we were going to gift it to the school for the 20th anniversary. The students worked all year on a NPDL project (New Pedagogies for Deeper Learning). They researched people like Martin Luther King Jr., Nelson Mandela, Jeanne Mance, and how they made a difference in their community. In April, I met with the teachers again and we came up with a plan. We were going to have the kids sew the quilt top and then I was going to finish the quilt for them by quilting it and binding it. They invited the ladies from my quilt group to come and help and it was awesome. I started by cutting up 4.5" squares from my scraps. I had squares from every colour of the rainbow. I laid the whole quilt top out in my living room first and numbered the rows so that it would be faster to then lay it out once we got to the school. Monday morning, three of my quilting friends and I showed up at school and set up three sewing machines, an iron and ironing board and laid out the quilt top on some tables. The students came in 5 at a time and we showed them how to use the sewing machines and how to sew 4 patches. We showed them how it was important to follow the edge of the foot to have the 1/4 inch seam. And how it was important to lay the blocks back on the table in the proper order so we didn't mix them all up. Some were excited and couldn't wait to start. Others were a little apprehensive but after watching their peers sew a few seams, they were eager and asking when it was going to be their turn! They all did so well and although there was a little ripping out, most of the seams matched up and everyone left the room so proud of their work! It took a day and a half of sewing to get the top done. It was great teamwork on everyone's part. Then I brought the quilt home and quilted it on the longarm. They requested rays coming out of the cross and I did some woodgrain in the cross. The students found quotes while working on their projects and I embroidered them in the cross. The quilt was unveiled at a gala they had last week. It will hang in the front lobby at the school. This was such a special project. The kids were so enthusiastic about sewing and making something for their school. They all remember which seams they sewed and are so proud of the work they did. So many of them went home and asked their parents if they had sewing machines and if they could take them out and sew. It was a very unique experience. One my quilty friends and I will cherish for a long time! My daughter was so proud to be able to share her passion for sewing with her classmates and she is so happy that the quilt will be hanging in the school for a long time to come. Back in February I made these six custom memory pillows for a customer. She called at the end of last year asking if I could make pillows from clothing of a loved one's clothing. He passed away a year ago this past March 1st and she wanted a pillow for herself, but also to gift pillows to his sons and his wife. She picked star patterns for hers and the wife's pillow, but wanted simple patchwork for the sons'. She had a nice variety of shirts so it was easy to match them up to make the pillows. I embroidered custom labels for the backs of the pillows as well. Pillows are a nice way to preserve memories of loved ones, especially when we want to spread the love between many siblings or if a quilt seems a little too expensive. You may remember the memory quilts I made last year for the four children who lost their father to cancer. Well today I would like to share with you the quilt I made for their mother Nancy. When I met with Nancy the first time, she had all of Kevin's clothes laid out in piles, separated by colour. When we picked the clothes for the kid's quilts, everything just came together perfectly. Nancy didn't know what she wanted for her quilt back then but by the time we came to work on her quilt, she was thinking she wanted a tree. And the funny thing was that the clothes that were left, were all in the perfect colour palette to make this beautiful tree. I started by drawing out the tree and the mounds of grass. They are made from his pants and shirts. Then I traced the leaves from some paper leaves Nancy had. Nancy gave me a list of scriptures that have special meaning to her and Kevin and I embroidered them on the some of the leaves. All of the leaves that don't have embroidery on them are from Kevin's clothes. I appliqued everything down using matching threads. I used a zig zag stitch for the tree trunk and the mounds of grass, and I used a buttonhole stitch for the leaves. The heart on the tree is also one of his shirts. I embroidered a K and an N on it before appliqueing it down with a satin stitch. The border is more of Kevin's clothing. The patch that says lucky you/lucky me is from his favorite pair of jeans, and the piece with the big clovers is the inside of the pocket from that same pair of jeans. The embroidered patches are from his Ralph Lauren polo shirts. The quilt was custom quilted to add texture. There are leaves in the outer border and ribbon candy in the green inner border. Some landscape meandering and wavy lines were added to the mounds of grass and the bark was quilted on the tree trunk. Details were added to the leaves and just a filler was quilted in the background. This is my favourite quilt I made in 2017. The meaning behind, the work I put into it... everything about it means so much. I am so happy that Nancy came into my life. It is truly a blessing. 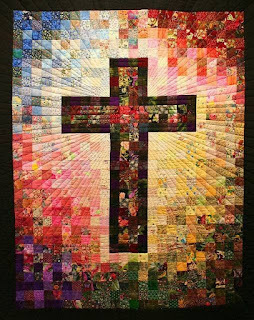 I am a fourth generation quilter and have been quilting for over 20 years. I love fabric and thread and sharing my passion with others. Please be sure to come visit again soon!